For those of you who celebrate this holiday (especially as a child), Easter holidays are always occasions full of surprise and delight. What could be more fun than hunting down delicious, hidden treats as a child? It is an adventure, one that grants you a reward at the end. An irresistible idea? 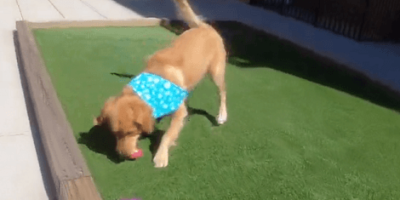 Aayan the Golden Retriever is still a growing pup, and thus still has a lot of things to experience for the very first time. In this particular case, it was time for him to experience an Easter Egg hunt for the first time in his life! This pup initially doesn’t quite understand what is going on – he knows he can run off, and thanks to his superior sense of smell, he knows there are treats around. Luckily, it doesn’t take him to long to find out where his first egg is – and the whole thing just snowballs from there!